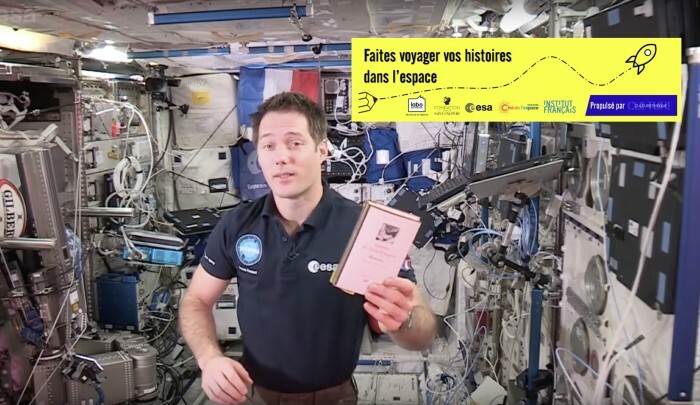 From the International Space Station the French ESA astronaut has launched a writing competition inspired by Antoine de Saint-Exupéry which is open to young writers aged up to 25. Deadline: 28 February 2017. “In an astronaut’s job, like that of a pilot, there is a strong technical element. But there is also an amount of dreaming and poetry.” This is how Thomas Pesquet, the tenth Frenchman in space and European Space Agency (ESA) astronaut, announced the first writing competition to be launched from the International Space Station (video below). A pilot, Antoine de Saint-Exupéry (1900-1944) is internationally famous for his literary works. In the video above, Thomas Pesquet (himself a former Air France pilot) also shows you the complete works of “Saint Ex” that he has taken on board the International Space Station. The “Faites Voyager vos Histoires” (Let your stories travel) competition announced by Thomas Pesquet is based on The Little Prince, the aviator poet’s legendary publication. In the story, the charming Little Prince visits 7 planets, giving Saint-Exupéry the opportunity to describe 7 characters that begins a reflection on life and the absurdity of certain human behaviours. A jury of personalities from the fields of aeronautics, space (including Thomas Pesquet, who is its Chairman!) and literature will select 10 works (5 from France and 5 others from 5 continents, namely America, Europe, Africa, Asia and Oceania). The rules state that “the winners will be invited to Europe in autumn 2017, for a series of activities related to space and writing”. Then on 6 April 2017, Thomas Pesquet will read extracts from his 2 favourite texts from the International Space Station. The two chosen authors will therefore listen to their story being read by an astronaut who is orbiting Earth! Under the patronage of the Secretary General of the Organisation Internationale de la Francophonie, Michaëlle Jean, this “Faites Voyager vos Histoires” competition is the result of a partnership between the Labo des Histoires association, the Antoine de Saint Exupéry Youth Foundation, the European Space Agency, the Cité de l’Espace and the Institut Français.